I’ve seen this booklet before in our collection but never really stopped to examine it closely. When I did, I was amazed at the art work and local history detail that went into creating this publication. 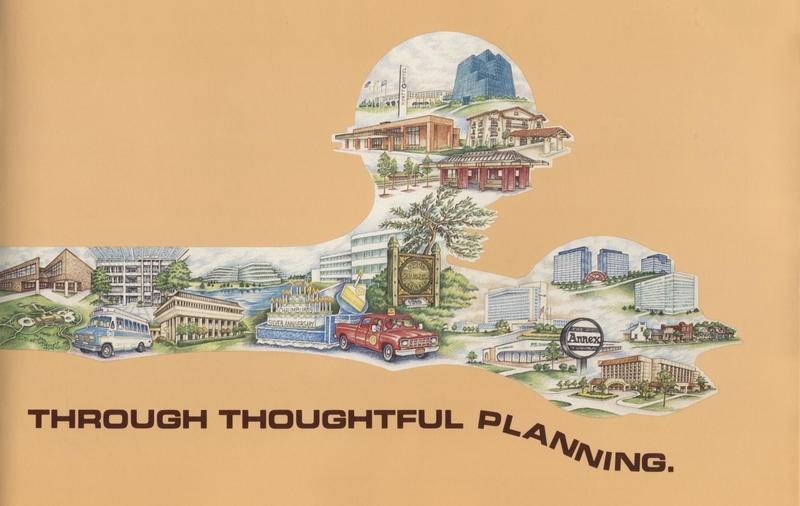 Designed with the intent to introduce Schaumburg to potential businesses, the publication was created in 1985 by Laura Carey and Dave Ogorzaly who were village employees. As Public Relations Coordinator, Ms. Carey designed and wrote the content. Mr. Ogorzaly was the artist who tracked the history of Schaumburg from its Native American origins to the present day. They included so much of the detail that I write about on this blog. So, let’s take a look at the history that is represented. It begins with this page. If you start at the left, the mural begins with Native Americans during pre-settlement days, fishing and hunting along the banks of, what I have to imagine, is Salt Creek. This segues into Horace P. Williams, an early settler who is known to have driven a flock of sheep from Ohio to Illinois in the early 1840s. We then see the German farmers who also began settling the area at this time. This is followed by the iconic St. Peter Lutheran Church of 1863 and its cemetery. Also tucked in is the 1848 small, frame, original church. 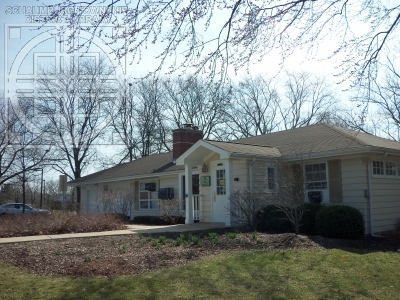 We then move to Schaumburg Center at the corner of Schaumburg and Roselle Road. 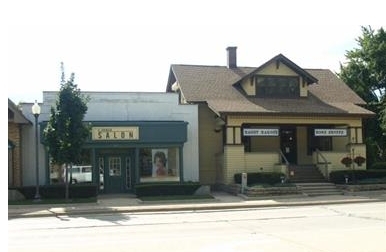 The Fenz general store that stood on the southwest corner is in the middle, the Buttery is featured at the bottom, the one-room, Schaumburg Center School is tucked in at the edge with the old Schaumburg Bank building that stood on the northeast corner below it. We can also note that the township’s first fire company from 1890 is added as is the term Easy Street. The area–and the Pub–were called Easy Street, not only because some of the wealthier commercial people of the township lived here, but because some farmers built new homes in the center part of the township once they retired. 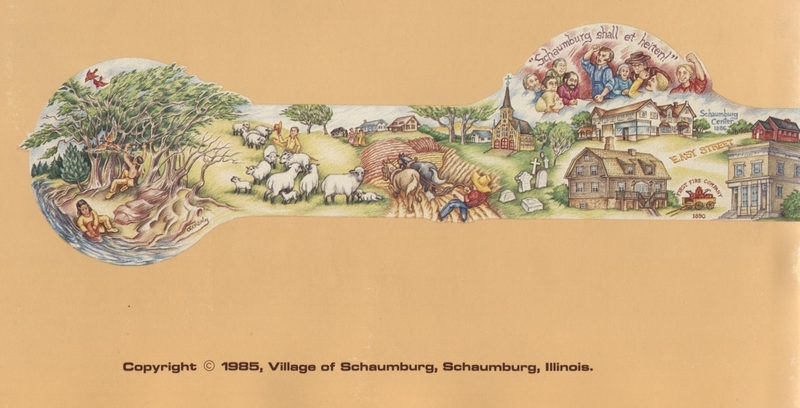 This second panel of the booklet begins with the incorporation of the village of Schaumburg in 1956. Three buildings that were originally the O.D. 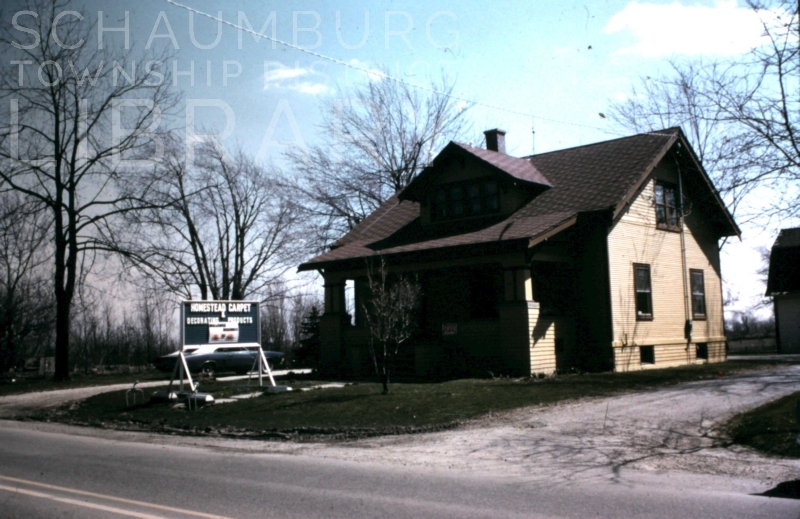 Jennings property and later became part of Weathersfield are first, starting with the white Barn of Schaumburg which served as the early village hall. Directly below that is the building that today serves as the offices for the Schaumburg Athletic Association. The Jennings house is to the right of the caretaker’s house. At the bottom are the early homes of Weathersfield. We then move to the Schaumburg Airpark off of Irving Park Road and Fire Station #1 that was on West Schaumburg Road, close to the intersection with Springinsguth. 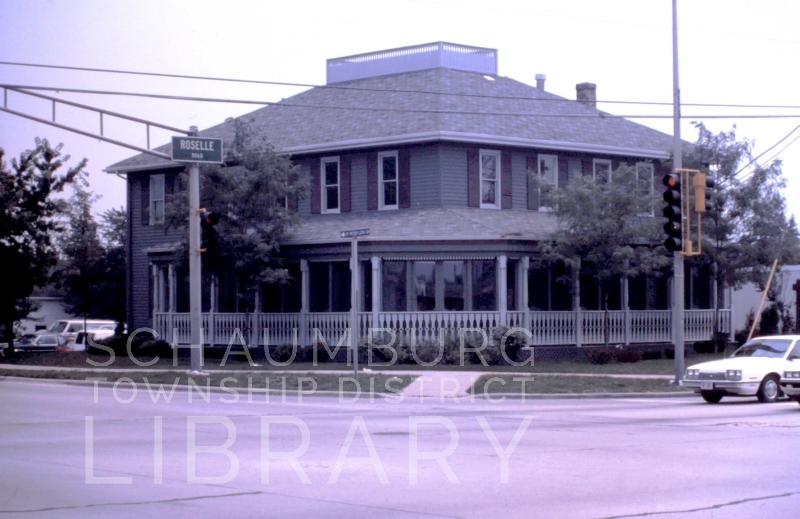 To the right of the Airpark is the front facade of the Schaumburg Township District Library when it was at 32 W. Library Lane. Below it is the Village’s logo and a representation of Schaumburg’s current Village Hall. The roads are I-90 and Meacham Road. Notice the south side of I-90 is represented by the water tower that remains on Wiley Road and buildings that are part of the Schaumburg Industrial Park. North of the tollway is the Motorola complex, centered by the tower that is now one of the locations of Motorola Solutions. 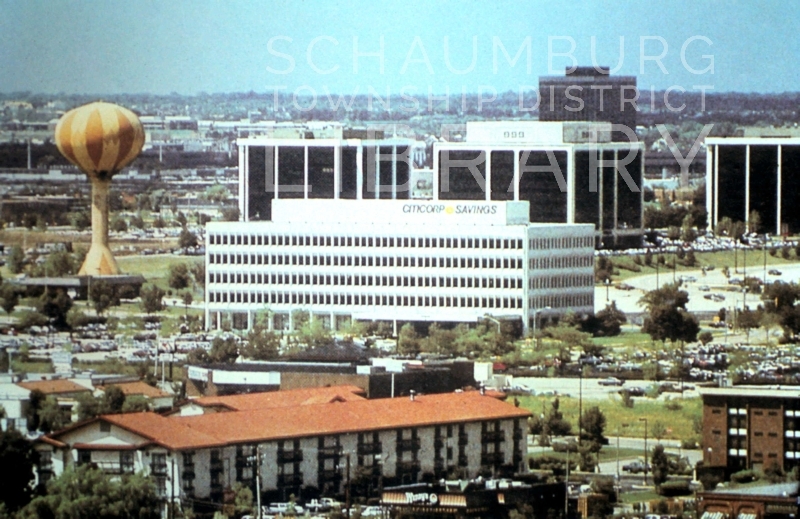 The collection of three buildings in the center of the photo represent International Village apartments which was one of the first apartment complexes built in Schaumburg. The bucolic water and tree scene represents Spring Valley Nature Sanctuary with the bicyclists making their way down one of the many bike lanes in Schaumburg. Of course, it is impossible not to recognize Woodfield Mall with its anchors that included Marshall Fields, J.C. Penney, Lord & Taylor and Sears. Note that the Woodfield water tower was still painted with its iconic brown and gold colors. Directly below the water tower is the brick monolith of Schaumburg High School to the left, and the Public Safety Building to the right–exactly as you see them today. 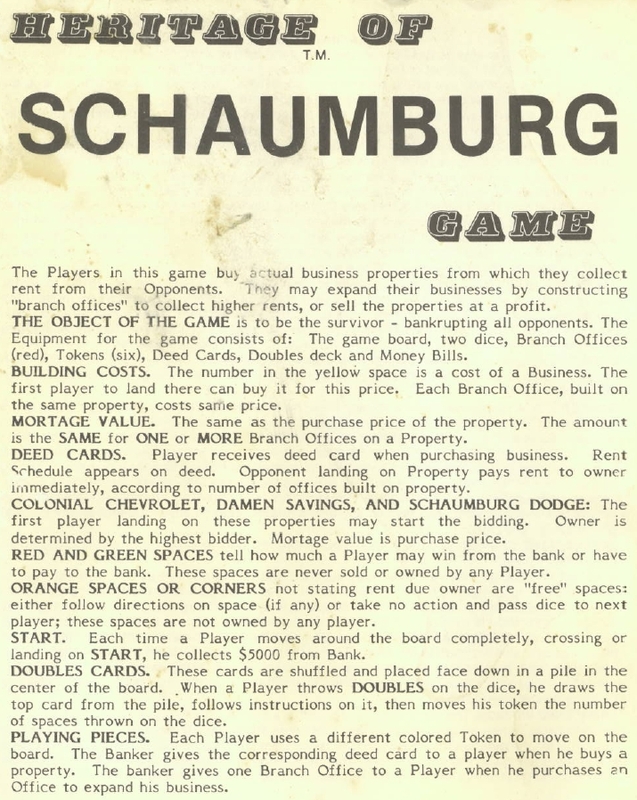 This last panel shows much of Schaumburg’s business history with a few governmental representations sprinkled throughout. From the far left we begin with the Community Recreation Center (CRC) that opened in 1979 at the corner of Bode and Springinsguth. Below it is the Pure Oil campus at Golf and Meacham with its distinctive, circular parking lots. The blue and white bus is part of the Dial-A-Ride Transportation that the village helped to support and above it is the atrium lobby of the Schaumburg Corporate Center. The next two white buildings at the top are Woodfield Lakes One and Two that are on Woodfield Road. Below Woodfield Lakes One is the brown, Brutalist-style structure that originally opened as Woodfield Bank in 1981 and is now Chase Bank. In the middle is the Olde Schaumburg Centre Park that was created in 1983 on the northeast corner of Schaumburg and Roselle Road. The red truck towing the float represents the village’s 25th anniversary celebration in 1981. The bubble at the top begins with the small, brown Schaumburg Metra Station that opened the following year in 1982 and the red brick Commuter Rail Facility that is currently on the north side of the tracks. The two structures in the middle are the Northwest Community Hospital Treatment Center on Roselle Road and the La Quinta Motor Inn on Higgins Road. At the top is the Hyatt Regency Woodfield Hotel and the multi-layered Tishman Building that is now Centennial Center on Golf Road. The final stretch of the panel off to the right begins clockwise with the Marriott Hotel that opened in 1983, Prudential One and Two that are along Martingale Road, the first Zurich American Insurance building that is now Woodfield Pointe Corporate Center, the First United Richport Center which is the set of shops and offices on the northeast corner of Schaumburg and Roselle Road, the Embassy Suites Hotel and, lastly, the Annex Shopping Center on Golf Road. It was obvious from the dates attached to the buildings that many of the corporate office buildings went up in the late 1970s and early 1980s. This view of that landscape is also from the brochure. Can you pick out some of the buildings/structures that were featured? Today, it is clear that, despite the fact the village was almost 30 years old, it was still the beginning of commercial development. The village knew it and put this attractive brochure together as enticement for other potential businesses to come to the area. Judging by today’s landscape, it is obvious they succeeded. This painting appeared at my desk the other day, compliments of the Schaumburg Township Historical Society. 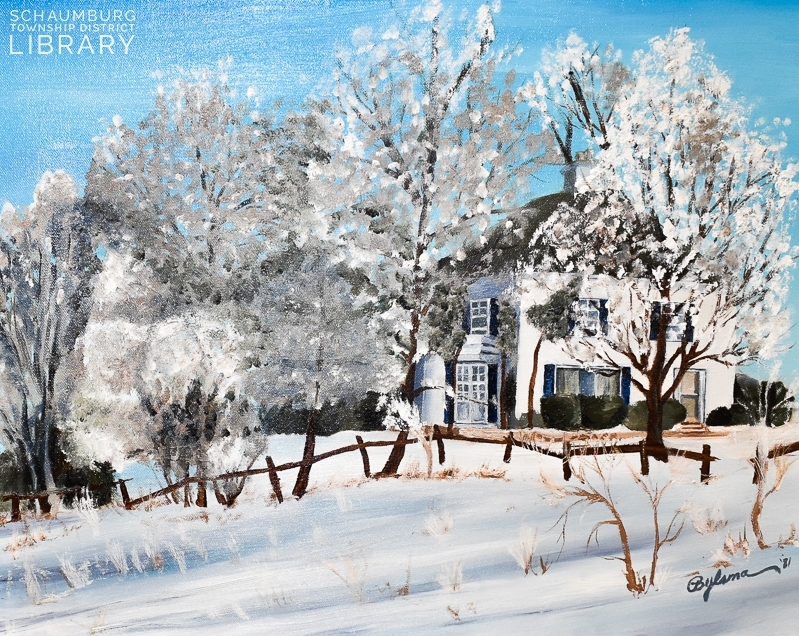 While putting together another post on farm paintings of Schaumburg Township, this one had come to my attention but took a while to track down. Now it was here. Unlike most of the paintings in the other blog posting, we know the artist. Pam Bylsma, a Fremd art teacher, painted the scene in 1981. The house was located on a farm that was bordered by Bode Road on the south, Knollwood on the west and Pennview on the north. Sheffield Estates subdivision exists on this property today and was built during a period of years that extended from 1976 to 1978. 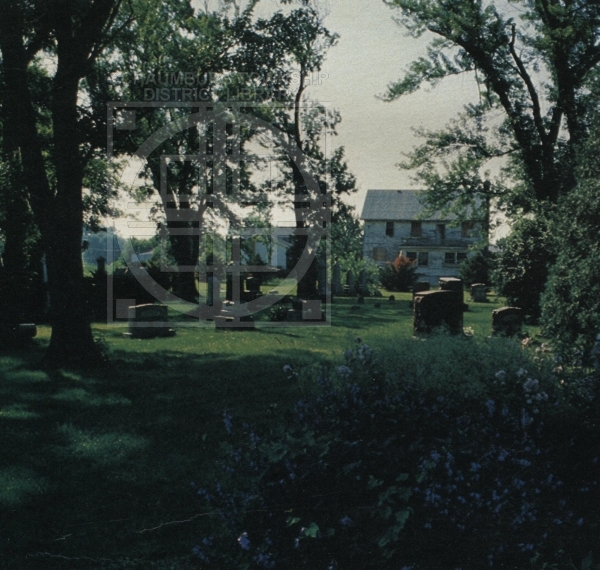 The painting was based on the photo below that was taken in the mid-1970s, before the house was razed. Judging by the written location and a 1954 plat map, it appears that this was August Lichthardt Jr.’s farm. 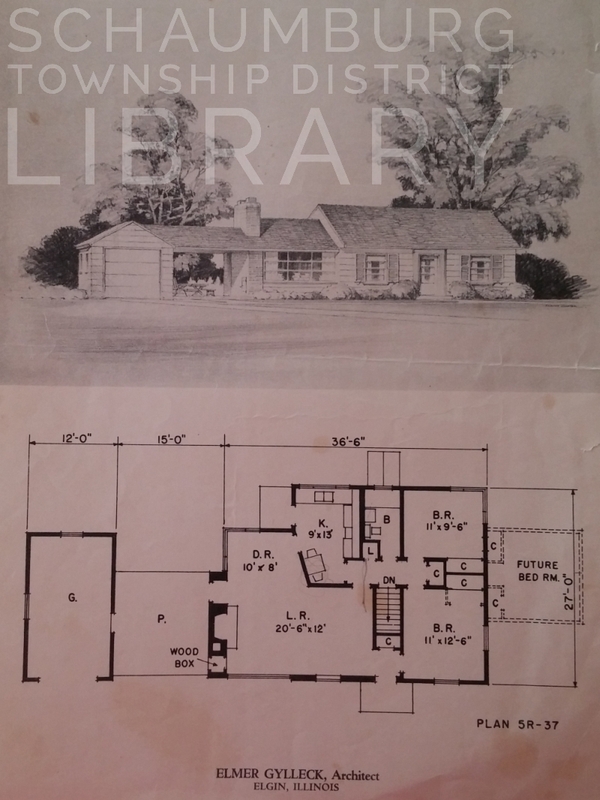 Using earlier plat maps in the library’s collection, it is possible to see that the farm had been in the Licthardt family since the late 1860s. Henry and Caroline (Wilkening) Lichthardt were the original Lichthardts on the farm. They had five children–August, Anna, Clara, Martha and Edward. Their son, August, inherited the farm and raised his family with his wife, Clara (Fasse) Lichthardt, who he married in 1905. They had ten children of their own–Erna, August Jr., Beata, Adelia, Malinda, Henriette, Arnold, Bertha, Florence and a daughter who died in infancy. Their son, August Jr. and his wife, Edna (Buesing), began working the farm in 1946 when August Sr. and Clara moved to Elgin. 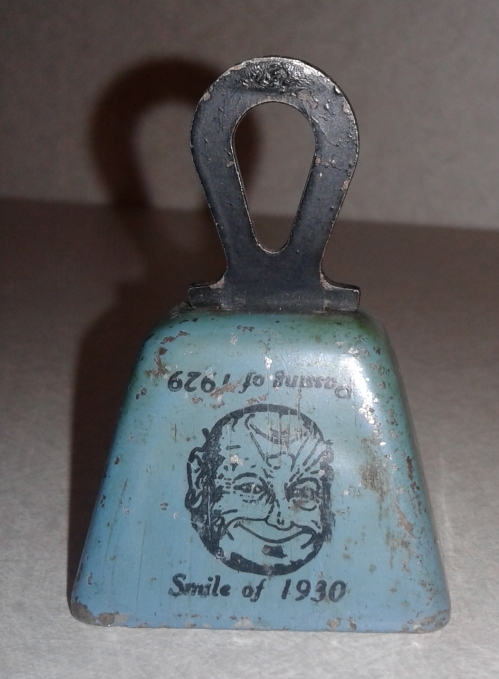 Ten years later, in 1956, August Jr. and Edna sold the farm and moved to Wisconsin. It is unknown who purchased the property but Levitt Homes eventually built the Sheffield Estates subdivision there. 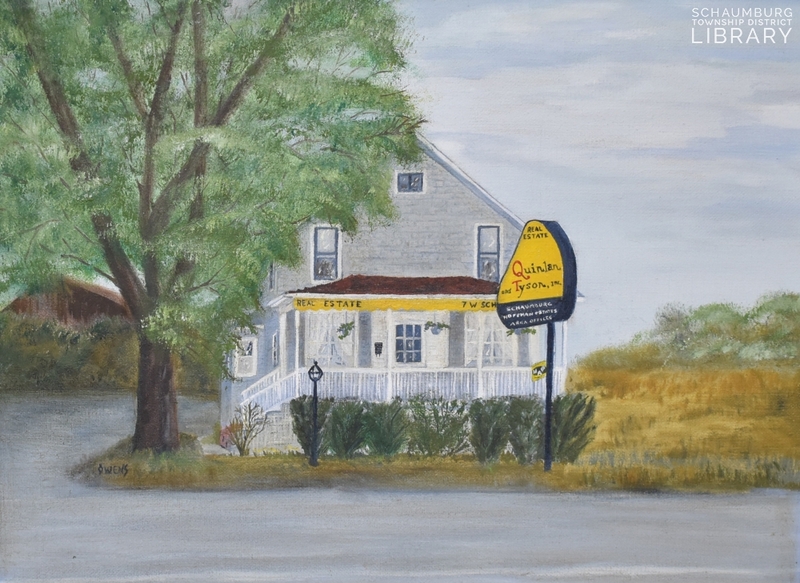 This rather unique painting of the Quinlan & Tyson real estate office is also part of the Schaumburg Township Historical Society’s collection. 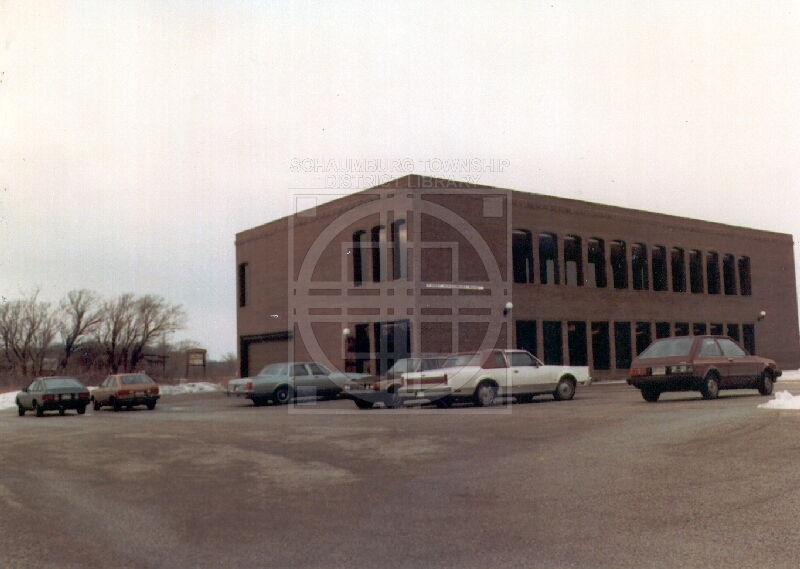 This building was on Schaumburg Road, east of the old Ace Hardware that sat on the southeast corner of the intersection at Roselle Road. This photo shows the house being torn down with the rather iconic sign in the foreground. 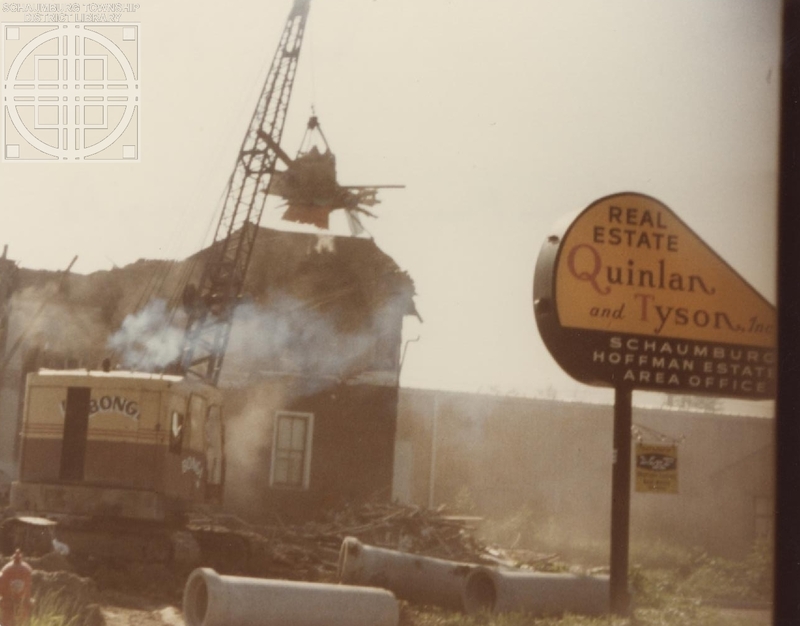 The destruction happened in June 1980 when the realty company moved into a new Quinlan & Tyson building just a bit east of the house. You can see that here. If you’d like to read more about this company and their Schaumburg location, check out the blog posting I did before the painting was uncovered. 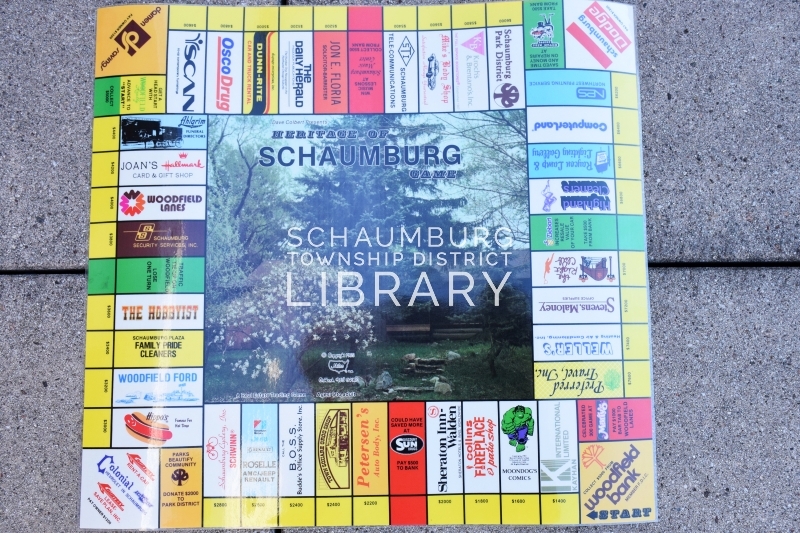 How fortuitous that Ms. Bylsma and artist Owens created these paintings of forgotten Schaumburg Township locations before they saw their demise. We do have photos but the paintings are a more beautiful representation of a landscape that is no more. If you have anything to add about either locale, please leave a comment below. Details help! When you are Gene Krupa and you’re the drummer for Benny Goodman’s band in 1936, it’s important that your drum kit is the best. And if you’re Gene Krupa and you’re from Chicago, who do you turn to for a well made set of drums? That would be the Slingerland Banjo & Drum Company. 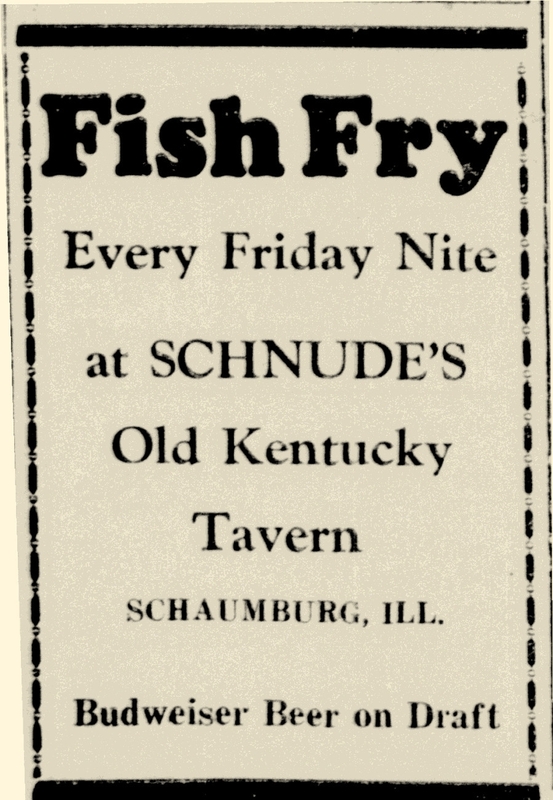 But, you ask, what does that have to do with Schaumburg? It begins with Walter Robert Slingerland who was born in Manistee, Michigan on March 30, 1889 to Samuel and Amalia Slingerland. One of eleven children, he left the farm and his family and moved to Chicago where he went to work for Armour & Co., the big meatpacking firm. Eventually, he was transferred to South Bend, IN and later, Detroit. On June 5, 1917 he registered for the World War I draft and was called for enlistment almost a year later on April 26, 1918. He served with the 85th division U.S. Army and was released the same year on November 27. He went back to work for Armour and, while working there, his oldest brother Henry convinced him to move back to Chicago. Once there, he joined him at the Slingerland Correspondence School of Music, where they offered a free, Slingerland-manufactured ukelele and twelve lessons. As stated in The Slingerland Book by Rob Cook, “H.H. was considered the money man while W.R. was in production and day-to-day operations.” They eventually moved into producing banjos and guitars and were well on their way with drums in 1929 by the time their second drum catalog came out. On January 12, 1924 Walter married Helen Rittenhouse of Hillsboro, Ohio in Chicago. They had their first child, Robert, in 1925 followed by Walter Jr. in 1927. The family lived on Belden Avenue on Chicago’s northwest side but, like his older brother, Henry, Walter was eager to get back to his farming roots. According to a 1959 article in the Daily Herald, “in 1941 they [Walter and Helen] purchased the 160 acres on Schaumburg Road where they still make their home.” This land (where the Schaumburg village offices are today) was originally purchased from the government by Conrad Salge in 1847 and eventually sold to a group of investors in the 1920s who created a golf course on the property. According to Wayne Nebel, one of our oral historians, the Slinglerlands converted the property back to its farming roots and paid tenant farmers to work the land. In 1945, during the final war year, their son Walter Jr. joined the Navy. According to the same Daily Herald article mentioned above, the Slingerlands moved their household to Schaumburg Township the following year and lived in “the house which was built over 100 years ago [and] was remodeled by Walter and Helen soon after they bought the property.” It was a pivotal year for Walter Slingerland because, not only did he move his family but his brother Henry died on March 13. Walter subsequently became president of the company that was now simply called the Slingerland Drum Company and commuted into the city for work. In 1951 Walter Jr. married his own Helen who was part of the Siems family of Roselle. 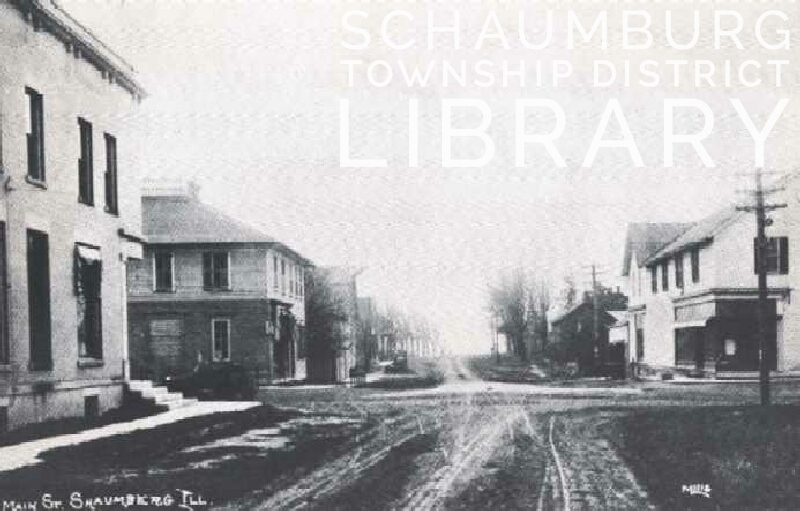 The elder Slingerlands gave a parcel of land to the young couple on the edge of Schaumburg Road. 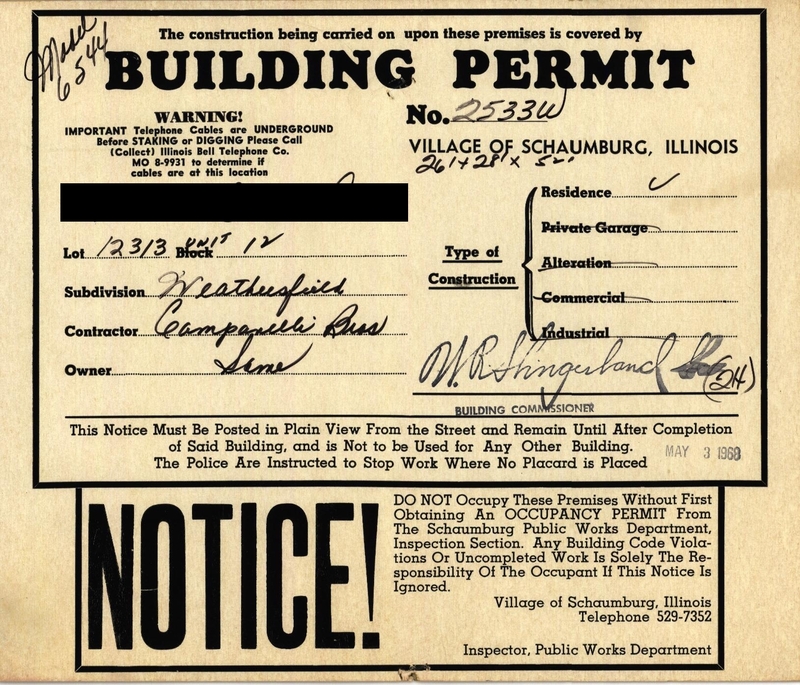 This is the building permit from Cook County that was signed on December 11, 1950 by Walter Slingerland Sr. who owned the property. It appears Walter split his 160 acres and denoted this as an 80 acre farm/tenant parcel. Note that a fair amount of the fees were for the septic field that would be added to the property. Walter and Helen then built and moved into this ranch house in the same year they married. The ranch was designed by Elmer Gylleck, Architect of Elgin, Illinois. You’ll notice that the breezeway was closed in at some point and a second garage was added. A third bedroom was also added on in the back of the house in the 1970s. 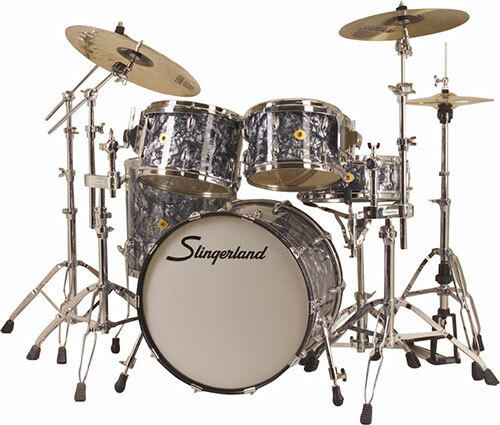 Three years later, in 1954, Walter Sr retired from the Slingerland Drum Company. Having lived in rural Schaumburg Township for eight years, it must have been apparent to Walter that change was coming. Given the small population, his business background and his farm’s prominent location on Schaumburg Road, he was familiar with others who were just as concerned about the coming growth. As a result, Mr. Slingerland was placed on the ballot for village trustee in 1956. He was successfully elected as one of the village’s first six trustees and served in that position for twelve years until 1969. During those years he served primarily as Building Commissioner. This was a position that oversaw the entire building process from permit to construction to signing off on the completed structure. The village now has multiple people to handle this process so we can imagine how, in the early years, Mr. Slingerland’s personal involvement was so crucial. 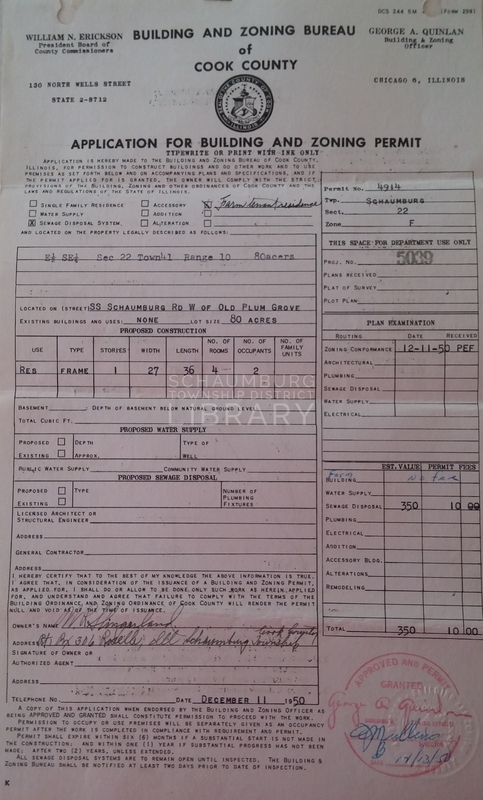 Below is a sample building permit that Mr. Slingerland signed with a stamp of his signature. He also served on the Zoning Board of Appeals, the Plan Commission, in the Public Works Department, twice on the Township’s Quadrennial Land Assessment Committee which evaluated land values, and was the trustee who pushed to change the village’s name from Schaumburg Center to Schaumburg. 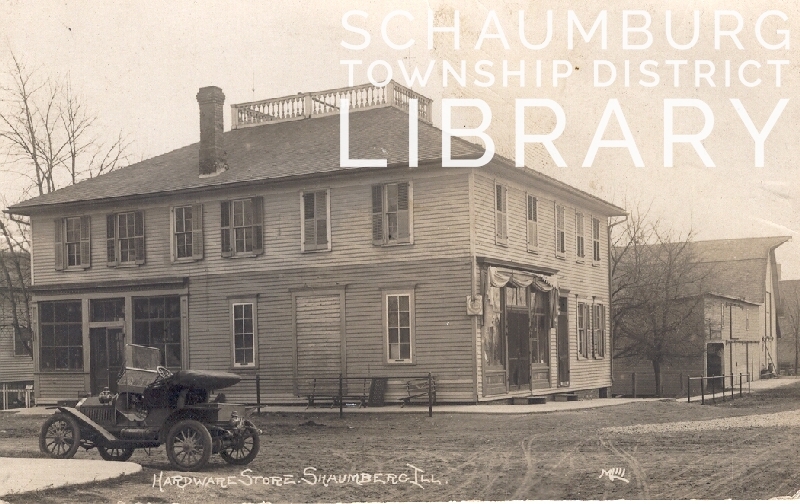 In addition, his wife Helen served as the village’s first treasurer and was a charter member of the Schaumburg Historical Society. Their involvement was key at such a dynamic period in village history. Prior to his retirement, the Slingerlands sold their property in 1962 and built a new ranch home at 400 Columbine Drive in Lexington Fields. They sold their portion of the farm to William Lambert who intended to develop a large scale, high density apartment complex in the area. He also planned to donate 40 acres of the property to the Village of Schaumburg with the intent that it would be the site of a civic/culture center. The Heritage Center complex never did get built but the village opened their Municipal Center in 1974 on the lovely spot we find it today. Amazingly enough, the old home that the Slingerlands bought in 1941 survived the development. 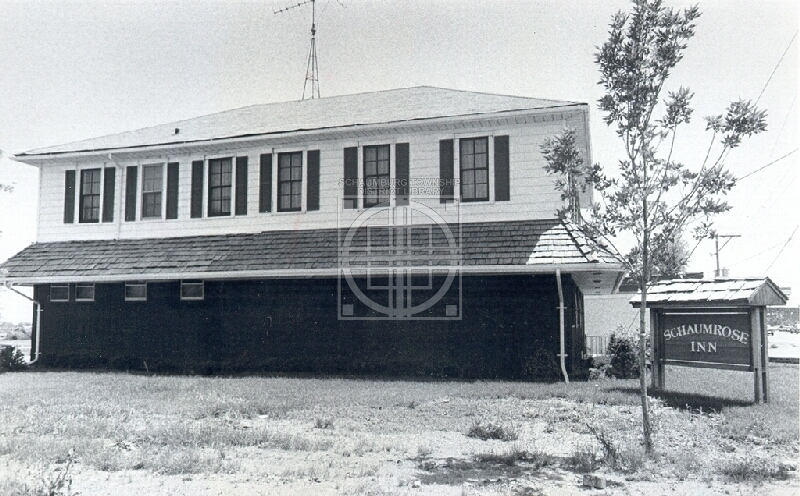 During construction of the Municipal Center in 1973 or 1974, the home was moved across the street to the St. Peter Lutheran Church property and can still be found there. If the dates are correct, this makes that home one of the oldest structures in the village. As you can see in the 1978 photo above, the home was a bit worse for wear but new siding was added around 1982. Thirty years later in 2012, the house was resided once again and remains in good condition. When the elder Slingerlands sold their property, the younger Slingerlands opted not to sell and remained in their ranch home. They were very active at St. Peter Lutheran Church and Walter served as one of the first presidents of Schaumburg High School’s parent group, the VIP’s. As the village property grew to include the Prairie Arts Center for the Arts, the Slingerlands sold their house to the Village in 1989. They worked out an agreement that allowed them to stay in their home until a time when they were ready to move. The home would then revert to the village. This happened in 1994 when the Slingerlands moved from the area. The house was remodeled and the Nursing and Senior Services Division of the village opened in 1995. This past summer, in 2017, the village board voted to move the Division out of the house and into the Market Square shopping center at Plum Grove and Schaumburg Road. This paved the way for future destruction of the house which will occur sometime after the move in July or August of 2018. We are fortunate that we still have the original house on the St. Peter property, close to the final resting place of Walter and Helen Slingerland Jr. at St. Peter Lutheran Cemetery. Both generations of Slingerlands definitely left their mark on the area, whether it was their houses or their time. In commemoration of all they gave, Slingerland Park in the Pheasant Walk subdivision and Slingerland Drive off of Weathersfield are named for the family. Do take a moment and think of them the next time you are there. Many thanks to Mary Helen Slingerland Owens, daughter of Walter and Helen Slingerland, for discussing details in this blog posting. She was most gracious with her quick responses and also passed on the building permit and architectural sketch of her parents’ home. Details for this blog posting were derived from the obituaries of the Slingerlands, war records on Ancestry.com, various articles from the Herald and The Slingerland Book which the library owns. 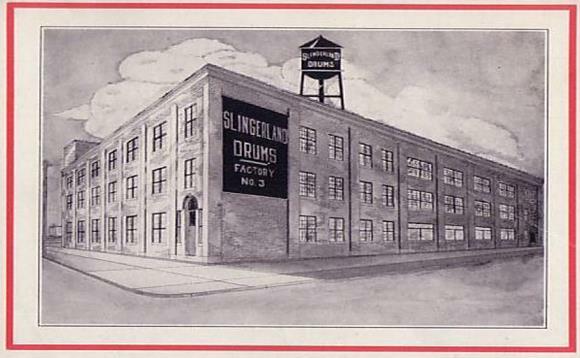 The photo of the Slingerland Drum Company comes from coopersvintagedrums.com We thank them for the photo. Last week Florence Catherine Bell shared her stories about what it was like to attend the one-room Schaumburg Center School. We received interesting and detailed information about the school that we hadn’t known before. In 1913 when this photo was taken this building was Farmer’s Bank of Schaumburg. It was on the northeast corner of the intersection and was moved in 1980 when the intersection was widened. 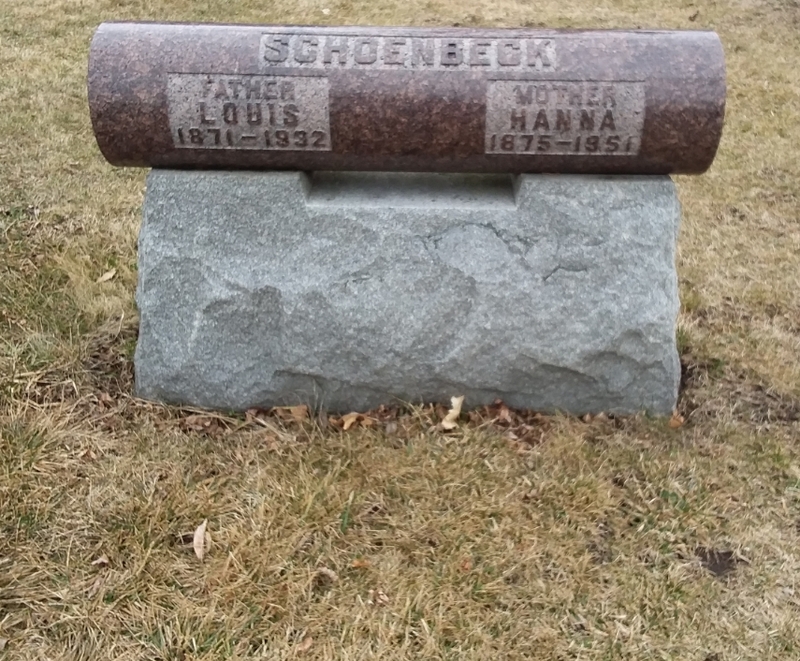 During Florence Catherine’s time in Schaumburg Township, her parents, James Austin and Florence Bell, did not use the bank but they did go in periodically. Florence Catherine remembers that it was small inside–even to a young girl’s eyes. She does not recall bars on the windows that a number of banks had during that time. She had no memory of a safe or vault or of any robberies that occurred. She did say that, as far as she knew, there were only the teller and his wife who worked there and they lived in the apartment above the bank. She remembered the banker as Mr. Kraft. In doing a bit of research, I discovered in a January 16, 1925 article in the Herald that this 100 year old lady wasn’t far off in the memories of her 7-year-old self! His name was William C. Kreft and he was listed as the cashier. In 1913 this building was a hardware store that was on the southeast corner of the intersection. It is currently Lou Malnatis. Florence Catherine remembers this as Schnute’s Tavern. It was owned by Herman Schnute and was, again, visited by Florence Catherine only a few times. She noted that this was a saloon even though Prohibition was in effect. She had a cute story about how her horse ended up having a beer at Schnute’s. “I was riding my horse, and there were all these guys standing outside of Schnute’s, shooting the bull. I stopped to talk to them and they got the idea to take the horse inside the bar to get it a beer. [They guided the horse into the bar], the horse smelled the beer and it backed out of the bar.” The horse obviously knew better. As far as the buildings to the right of Schnute’s, she did not recall what their purpose was. This was the Fenz store that was on the southwest corner of the intersection. It was a general store and farm implement dealer and, unfortunately, burned down in 1924. Even though Florence Catherine would have only been 7 at the time of the fire, it’s such an unusual building that I couldn’t resist asking her what she knew about it. She did not remember the building but she did recall that the bottom part was still there. She said, “We would cut across the area where it was burnt” as they walked to and from the Schaumburg Center School that she attended on Schaumburg Road. 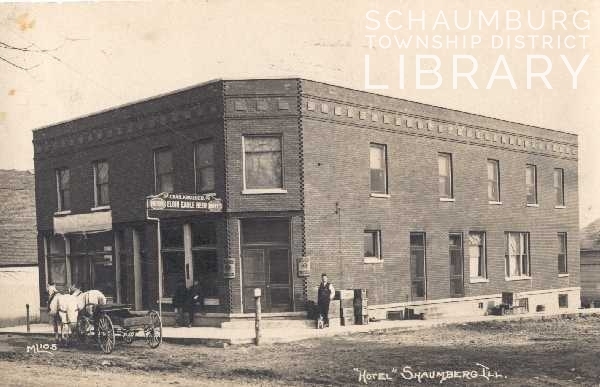 This parcel remained empty until Schaumburg’s first mayor, Louis Redeker, built a small, one-story building on the corner that later became the Tri Village/Ace Hardware. 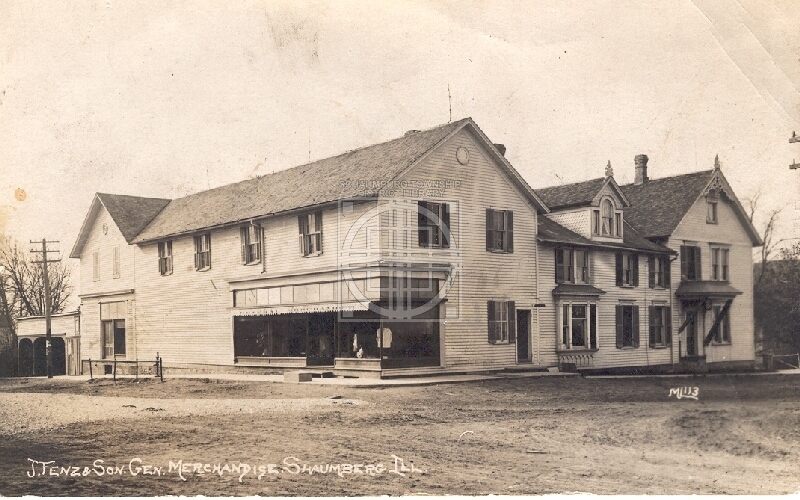 Originally a hotel and saloon that was owned by Charles Krueger, the business was purchased in the 1910’s by Frank Lengl. 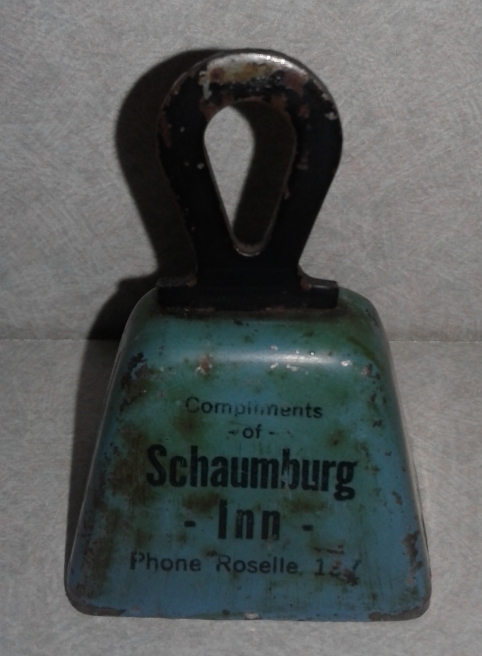 He eventually renamed it Lengl’s Schaumburg Inn. Mr. Lengl also built a big stage at one end. The public schools would use that area for their graduations. This is a drawing that her granddaughter drew of the layout of Lengl’s during the years Florence Catherine was familiar with the business. Orient yourself by where the door is at the corner. Behind the bar area was a partition that separated the restaurant from the bar. This is a view of the intersection looking south down Roselle Road. By the time Florence Catherine lived at Stratford Farms, Roselle Road was paved while Schaumburg Road was still dirt/gravel. According to her, the view looking south didn’t really look that different during her day–except for the fact that the Fenz store to the right was gone. I’ve heard stories about how narrow this road was in the 1950s and 60s so it sounds like the situation really didn’t get much better over time. Things finally changed after the road was graded and widened. It’s nice to have these small details added to our local history. Kate, thank you once again for your sharp memory and good observation skills. I still can’t believe that you remembered Mr. Kreft’s name! 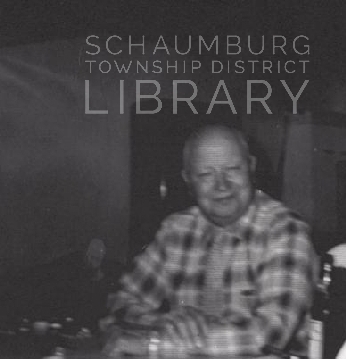 During Schaumburg’s 60th anniversary year of 2016, we will take a look back at the Schaumburg you’ve known for the last six decades. Every month there will be a posting on 3 village happenings for each decade the village has been in existence. Maybe you remember some of the events and have something more to add to a few of the items? Send in your comments! Pure Oil gained approval from the Cook County Zoning Board of Appeals at a hearing at Schaumburg School to change the zoning on their property from farming to business use. The 62-acre tract would scheduled to hold a new office that would accomodate 1000-2000 potential employees. 100 young 4-H’rs were in attendance at Schaumburg School for the Schaumburg 4-H Agricultural Club’s achievement night and Christmas party. The home of Mrs. Minnie Kastning that was across Roselle Road from the Turret House, burned to the ground Monday, December 10. Mrs. Kastning was rescued from the home by firemen who were alerted to the fire at 2 A.M. by a passing motorist. The Illinois State Chamber of Commerce announced that the three largest new building facilities in Illinois for the year 1966 were the $395 million dollar accelerator being built at Fermilab, the nearly $30 million dollar foundry being built at Silvis and the 674,000 square foot Motorola plant. The latter was the largest facility being built under one roof. Final approval was given by the District 54 board to purchase and install 5 mobile classrooms in the district. They were expected to alleviate crowding at Fairview, Campanelli and Hillcrest schools. In a Chicago Tribune article on Woodfield at Christmas, a variety of stores were mentioned: Two-Plus-Two Jewelry, Sears Roebuck, Puppy Palace, McDonalds, I-Natural Cosmetics and J. C. Penney. The same article stated that the mall was so crowded during the season that employees parked at Pure Oil and were shuttled across Golf Road to the shopping center. The a capella quintet named Stormy Weather was scheduled to perform on December 19 at B’Ginnings, the Schaumburg nightclub on Golf Road. They were noted for performing “doo-wop” or “street corner” singing. The Chicago Tribune reviewed a new Asian restaurant in the Woodfield Commons Plaza at Golf Road and National Parkway called Fu-Lama Gardens. They offered not only Chinese cuisine but Szechuan, Japanese, Polynesian, Cantonese, Mandarin and Indian specialties. At their new store at 130 W. Golf Road in Schaumburg, CompuMat was featuring “the most advanced personal computer in the world.” It was a Compaq Deskpro 386. The Woodfield Plitt Theatres were showing the following movies at the beginning of December: An American Tail, Star Trek IV, Peggy Sue Got Married, The Nutcracker, Children of a Lesser God, Firewalker, Crocodile Dundee, The Color of Money and Something Wild. The following older subdivisions were targeted for street lights in the near future: Lexington Fields Estates, Meadow Knolls and Pleasant Acres. An increase in vehicle sticker fees was being considered as a way to pay for the lighting. It was announced that the Winkelhake Farm on the southeast corner of Higgins and Plum Grove Road would be sold for development to Cambridge Homes. The property was the last farm in Schaumburg and had been owned by the Winkelhake family since the original land grant purchase in 1846. Medieval Times decided to freshen up their act a bit by garbing their knights in armor instead of chain mail and adding a court sorcerer, new pyrotechnics, high-powered stereo system and new bright and colorful costumes. The business opened its first castle in 1983 in Kissimmee, FL. The Schaumburg Sister Cities Commission planned to send a group of health care professionals to the sister city of Schaumburg, Germany to view their country’s outlook and practices in the medical field. Santa Claus was temporarily kept from his chair in Woodfield’s Central Court for an entire day when a decoration suspended from the ceiling caught fire in the early morning hours of December 11. He was back in place the following day. Elio’s Pizza at 977 W. Wise Road was having their grand opening special and offering 50% off any pizza or pasta on Tuesdays. The Village of Schaumburg began a new, annual tradition of selling a Christmas ornament that depicts a local establishment. 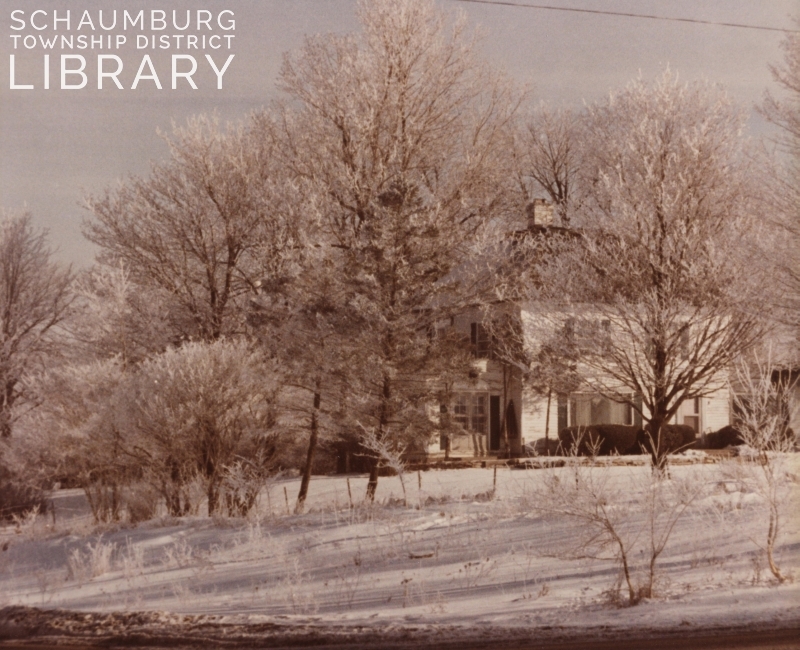 The tradition was established as part of the village’s 50th anniversary celebration and the first ornament design was the Turret House on Schaumburg Road. The photo of the Weathersfield Commons Shopping Center is used courtesy of the former Profile Publications of Crystal Lake. The photo of the Winkelhake farm is used courtesy of Spring Valley. The factual items for this blog posting were taken from stories that appeared in the Daily Herald and the Chicago Tribune. More than 1500 suburban residents–including those from the newly formed village of Schaumburg–participated in a fund drive to raise $1 million for a new hospital to be built near Arlington Heights. The hospital was to be named Northwest Community Hospital and is shown below. In a classified ad in The Herald, a “modern 2-family house, [with] income $200 per month, large barn [on] 5 3/4 acres” was listed for $17,000. 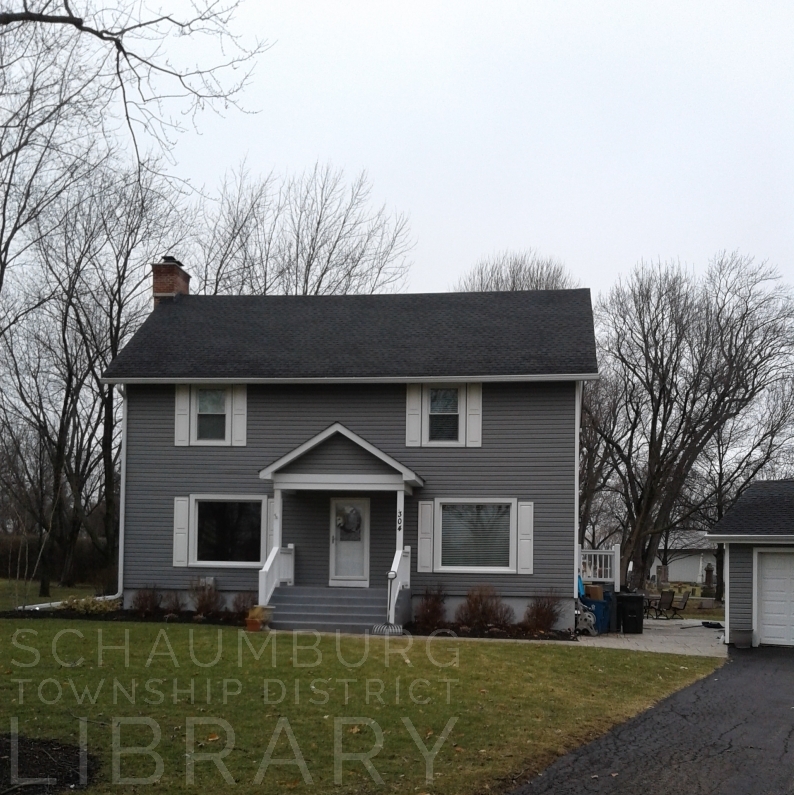 It was listed as being the first house east of the church in Schaumburg. The reference is to St. Peter Lutheran Church along Schaumburg Road. Anyone having scrap paper and/or rags was invited to drop them off at St. Peter Lutheran School on Friday, November 23, the day of their Scrap Paper Drive. It was requested that the bundles be securely tied. Ace Hardware, at the corner of Schaumburg and Roselle Roads, was having a sale on the following products: TV tray table set for $5.99, deluxe wall can opener for $5.87, portable ice crusher for $7.99, 8-inch cast iron skillet for $1.89, bath scale for $8.99 and clock radio for $13.88. It was announced in mid November that Mayor Robert Atcher would run for reelection the following April. A slate of three additional village board candidates of the Schaumburg United Party (SUP) was also announced. They include: Raymond Kessell, Donald Wench and Gordon Mullins. Sandy Carsello was also included as a candidate for Village Clerk. An open house for the new Thomas Dooley school was scheduled for Sunday, November 20 from 1-4 p.m. 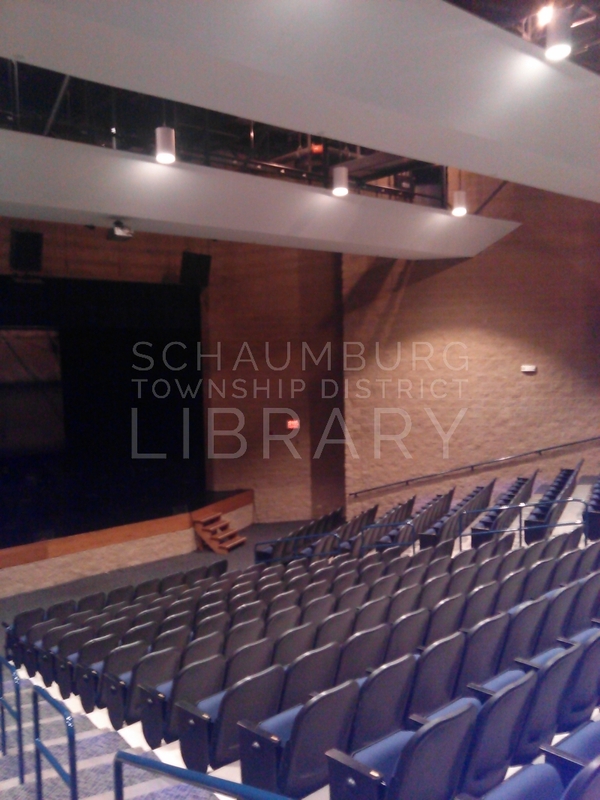 It is the 12th school in Schaumburg Township and the third school in the village of Schaumburg. The building was built to resemble its sister school, Winston Churchill School, in Hoffman Estates. The principal was Karl Plank who had been previously employed as principal at Black Hawk school. Schaumburg banded together with seven other northwest suburban communities to begin the process of getting on the Lake Michigan water pipeline. The name of the group was called SHARE +3. The projected cost for the village was $11.8 million to $16.6 million. 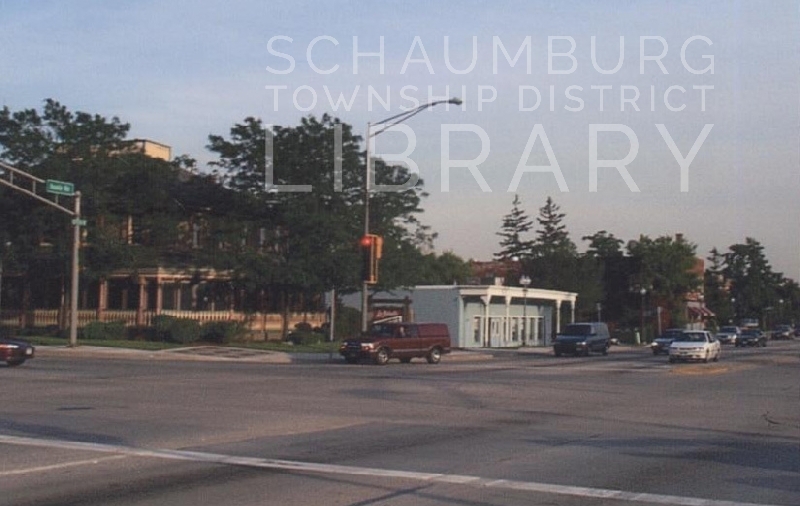 Schaumburg Road between Springinsguth and Barrington Road was scheduled to be improved and widened. The award for the 1 1/2 mile stretch of road was awarded to Palumbo Excavating Co.
Musicland and J.G. Music Center in Woodfield Mall was advertising specials on the following stereo lps and tapes: Phoebe Snow’s It Looks Like Phoebe Snow, Blue Oyster Cult’s Agents of Fortune, Earth Wind & Fire’s Spirit, Neil Diamond’s Beautiful Noise, Boz Scagg’s Silk Degrees, O’ Jays’ Message in the Music, and Boston’s Boston. Daruma of Schaumburg which opened at 1823 W. Golf Road in Schaumburg in August was reviewed in the Chicago Tribune. The long-running, Japanese restaurant can still be found in the same location in the Poplar Creek Plaza thirty years later! On Black Friday, the Friday after Thanksgiving, the parking lot at Woodfield Mall was filled with 10,288 cars by 1:00 p.m. The attendance was estimated to be 150,000 which was the norm for the past few years. The Annex shopping center in Schaumburg was having sales at the following stores: Mix ‘n Munch, Card & Gift Gallery, Pier 1 Imports, Kids Place, Stacy’s Bags and Baggage, Space Options, Pro Ski & Surf, Waves Personal Hair Care, Van Heusen Factory Store and Lingerie Factory. Consideration was given by the village board to requiring address numbers of businesses to be a certain size, depending on how far the establishment is from the street. It was reported that, for the first time, Septemberfest turned a profit and moved closer towards being a self-supporting event. The success of the festival was attributed to corporate sponsorships, increased fees, in-kind donations, a larger take of the Taste of Schaumburg food and beverage receipts and cleanup by Manpower. Mayor Larson laid the first brick of the new terminal at Schaumburg Regional Airport. This kicked off the development of the building that would hold administrative offices, a restaurant, aircraft maintenance areas and a flight school. Pilot Pete’s became the eventual restaurant and can still be found at the airport. Schaumburg announced they would be be featuring another year of the outdoor holiday festival in Town Square called Christkindlesmarkt. 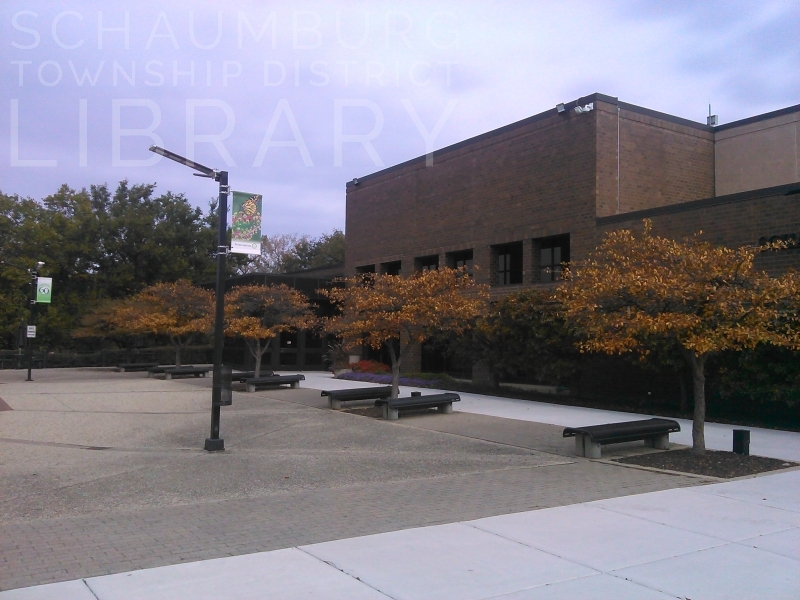 Sponsored with the Schaumburg Township District Library, the festival would be an open market with European influences. A Festival of Lights would be part of the festivities as well as horse-drawn sleigh rides. Janet Niemann, the founding chairperson of the Schaumburg Sister Cities Commission, passed away November 6. She also chaired Schaumburg Township’s Youth Commission and was very involved in the Jaycees and Jayceettes, having been a past president. El Meson, Rupert’s On The Top and Prairie Rock Brewing Company all were featured in a Night Out: Guide for Dining and Entertainment in the Daily Herald. The photos of Northwest Community Hospital and the clock radio are used courtesy of the Daily Herald. The photo of Pilot Pete’s is courtesy of Ted and John Koston from their Flickr page. 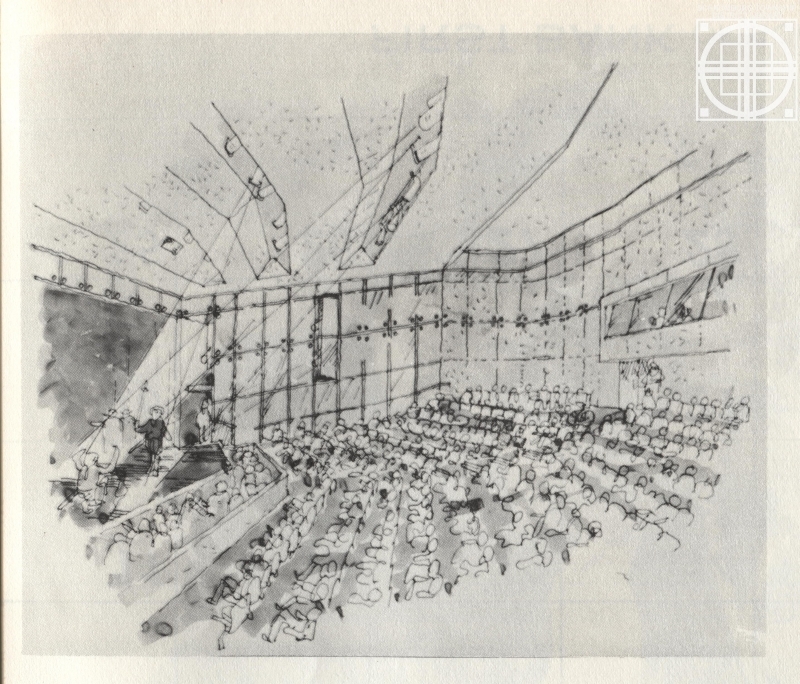 These wonderful renderings of the Schaumburg Prairie Center for the Arts were recently discovered on a 1983 calendar prepared by the First Bank of Schaumburg. 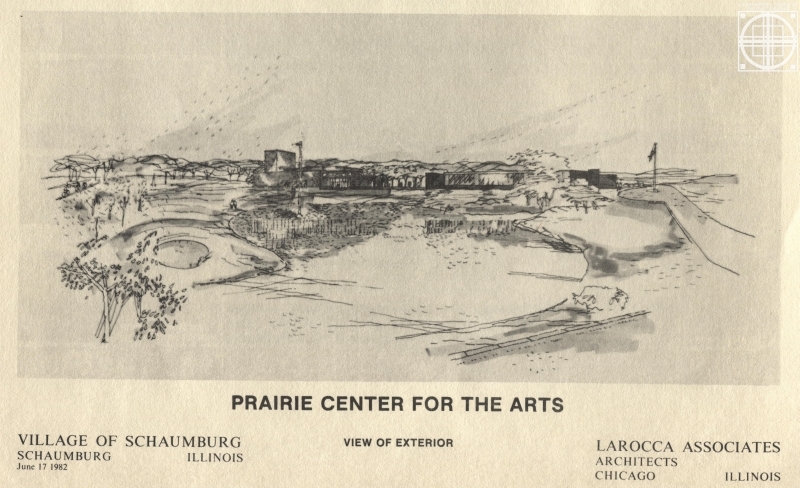 The drawings were created by architects, LaRocca Associates of Chicago, in anticipation of construction of the Prairie Center. It had been many years in the making and was soon to come to fruition. Two years later, on March 13, 1985, the invitation for bids went out to the public. Final approval had been given for a building that would contain a 429-seat theater, ticket office and conference rooms, as well as an outdoor plaza. The location would be just east of the Municipal Center on Summit Drive at a planned cost of $2.2 million. The project was paid for through a special endowment of funds collected over the years from developers. Not surprisingly, there had been earlier suggestions for an even larger venue. As far back as 1968, former Mayor Robert Atcher had originally planned a 500-seat drama theater and a 900-seat concert hall. Scott Fisher, who was the chairman of the Cultural Commission in 1983, favored a 750-seat hall but the price was too high. And, interestingly, prior consideration had also been given to a proposed site near Woodfield Mall. The bid for the scaled down project in 1985 was eventually awarded to International Contractors of Elmhurst and building commenced in May of that year. During the course of construction, consideration was given to who would be the director of the Cultural Center. By July, Village President Herbert Aigner suggested that the village board opt for former President Bob Atcher as the ideal candidate. “His heart is in this. He’s in the entertainment field. He’s got contacts with major business people and a tremendous reputation.” (Daily Herald, 7/17/1985) After giving it some thought, the 71-year-old President Atcher turned down the job, concerned that the time necessary to devote to the job was more than he was comfortable with. In October the village hired Elizabeth Armistead, former program coordinator for the Hemmen’s Auditorium in Elgin. Going forward, her duties were to manage the Center, be involved in the construction process of the building, establish a group of part-time workers to assist her in day-to-day operations and seek out entertainment for the venue. To this day, Ms. Armistead continues in her role, even as that role has expanded to include oversight of Septemberfest, the Prairie Arts Festival, the village’s cable channels and the Volunteer of the Year Awards program. On June 14, 1986, a little over a year after the project had begun, grand opening ceremonies were held. The stars of the show were former Schaumburg Village President Robert Atcher and his wife Maggie and their three children. Having long desired such a facility for the village, the Atcher family returned their gratitude with a country and western concert to the an appreciative audience of nearly 200 people. Kudos were also extended to William Lambert who originally donated some 40 acres of land to the village as the future site of the municipal center and cultural center. He was given the honor of cutting the ribbon that stretched from end to end across the new stage. Twenty years later, during the 50th anniversary year of the Village of Schaumburg, the theater at the Prairie Center was officially dedicated to Maggie Atcher who helped form the first cultural arts commission in Schaumburg. It was a fitting bookend to the building next door, the Robert O. Atcher Municipal Center. Today the Prairie Center continues to offer itself as a lineup for entertainment, a venue for local orchestras and choirs and a patio for the festivals held on the municipal center grounds. Even if you haven’t been there for an attraction, you may just want to stroll the grounds. The walking paths are an enticement to return again!